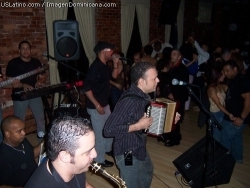 Perico Ripiao is one of the three types of merengue played in Dominican Republic. This is considered the typical type of merengue and the oldest still played. 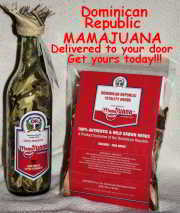 It originated in the Santiago area in the Cibao Valley region of the country. It first appeared in recorded history in the 1840's. This type of music was attacked by the moral people of the country. Because of the sensual movements of the dance and the same type of lyrics that accompanied the music. Legend says that it was called Perico Ripiao (which means Ripped or Plucked Parrot) after a brothel where the music was played originally. The moral minority lost in their efforts and Perico Ripiao became more popular and it still is today. The music is normally played with 3 main instruments. The güira which is a metal musical instrument said to have originally came from the Taíno Indians.They called it a güira and it was originally made from a gourd. It is also called guayos (graters) because of its resemblance to a food grater. (to read about the making of a güira go here). It is played with a fork like scraper. The Tambora, which is a two-headed drum of African origin is normally played with a stick. The third instrument, the accordion, said to come from trade with the Germans for tobacco, is also played. Now most groups have left changed from the 3 man groups to a 5 man bands, having added the saxophone and bass guitar. When in Dominican Republic you can see these men walking the street playing for the people for a small fee. It is always fun to have them play a song or 2 for you. This is not just a tourist thing. More Dominicans have these roving bands play for them than do the tourists. I have a video of one of these bands on the musica tipica page here (opens in a new window). Aguakate is a band whose members are from all parts of Dominican Republic. Fefita is from San José Santiago Rodríguez, in the northwestern part of the Cibao region in Dominican Republic. She learned to play the accordion from her father. Petán Trujillo,a relative of the dictator, saw the then 12 year old Fefita play her accordion and he knew this girl had talent. Her career bloomed from that day in the early 1940's. She was the first woman accordionist to be recognized in Dominican Republic. She surly deserves this recognition. She is the only person that can play her style of music. 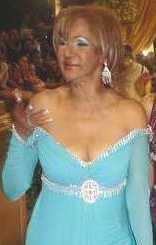 Fefita la Grande has been performing for more than 40 years and with her energy she may be around for another 40 more. In 2008 she won el Soberano (the Sovereign or King) from the Asociación de Cronistas de Arte, the people that run the Casandra music awards. This is the highest award an artist can receive. Tatico Henríquez (d.1976),who was born in Nagua, Dominican Republic, is considered to be the godfather of modern merengue típico. The changes he made to the genre gave the merengue a new flair. He was originally a member of the group Trío Reynoso where his style of playing the accordion made him immediately loved. His playing was said to be described as intense. He used electric bass and saxophone much more frequently than it was ever used in the past. He brought it together in a way that it all harmonized with the accordion. He sped up the tempo of the merengue and changed the way música típica was played. Tatico then took the genre to a waiting public with his grand compositions and style. Even with his rough, untrained voice he made it with his unique style and lyrics. He appeared on radio and television thus making his compositions known to the country. 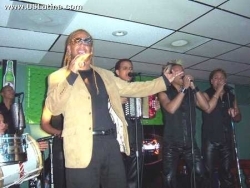 Others started imitating his style and made his songs their own thus making Tatico Henríquez' music to be on most típico musicians play lists. He will be forever remembered for what he did for music. instrument before. He is one of the most desirable additions to any concert in the country of Dominican Republic.. For that matter, any concert featuring merengue music world wide would be ecstatic to have El Prodigio on their roster. Born in Cabrera, a providence of María Trinidad Sánchez, Dominican Republic, November 1976. Krency (his given name), took to the accordion immediately, thus the name "El Prodigio" (the Prodigy) His first time playing in public was when he was only 5 years old. He continued to play and got local recognition, even appearing on a TV show at an early age. El Prodigio, along with his quartet, recorded their first single recording "No Te Vayas En Yola". El Prodigio picture taken 10-05. Geovanny Polanco born in Nagua in 1974. The love of music was in his blood due to his father who played the accordion. His father stopped playing music before Geovanny was born so he did not influence his son to play at a young age. But when Geovanny started getting interested in fighting roosters his father bought him an accordion to try and divert his attention from this sport he did not like. The 15 year old boy promised to look to music and never get involved with fighting roosters. His father sent him to Santiago to further his schooling. He worked in a few different jobs and played in a few different music groups. He got married and had a few kids Then he met Aureliano Guzman who saw the talent Geovanny had. 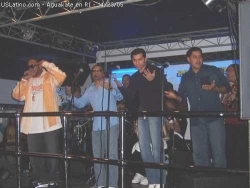 With their combined talents they formed the group Geovanny Polanco y Su Manbo Swin. With Guzmans knowledge of the music industry and Polancos talent, this typical working man made it in the music world. He now had a record company in Santiago called Jhandell Record. For more information check out his web site. Krisspy (also spelled Krisspi) brings a whole new style to Música Típica . Born Juan de los Santos he has gained much popularity with his raw humorous style. Fefita la Grande or La Mayimba. has been in the Dominican music scene it seems like forever. Whichever name one knows her by all know she is one hip accordion playing, hip wiggling, bright fire-red haired grandmother. With her sharp tongue and semi-rude jokes, she is one fun entertainer. Arts he learned more how to interpret the sounds that were in his head. This led to more awards, mass recognition, and ultimately gave us the El Prodigio we love today. His music had given the lovers of this style of music mush to be happy about. It keeps the feet moving and for Dominicans, dance is one of the things they love the most!